So, when I think of England, I usually think of Buckingham Palace, Big Ben, the London Bridge, ect. Sometimes the quaint countryside come to mind, and I find that to be very intriguing. But how in the world could someone (a foreigner) enjoy its beauty? Personally, I think it’s lame just to settle for the English countryside via the latest Jane Austen movie that BBC produces (and in no way am I trying to belittle BBC. I think they do a fantastic job). It’s not your commonplace camping. They call it luxury camping or ‘glamping’. They’ve developed a collection of places which are beautiful and quirky at the same time. One in particular stood out to me…and its calling my name. It’s called “The Geo” and is located in Cornwall. It mixes modern and nature together. It’s sustainable and at the same time caters to your necessities. Yes, it has its own private kitchen and bathroom. Upscale camping? Yep. Think you would get bored with a mod-tent and some trees? Think again. There’s plenty to see and do around the area. Hiking, bike rides, surfing are all suggested activities…and Tintagel castle is also in the area. However, if “glamping” isn’t your thing…you’ve got to check this place out. Located in Swinithwaite, North Yorkshire, the Temple of Folly was built in the 18th century. It’s octagon shape makes it a rather unusual building. It was originally built to be a summerhouse or belvedere for a gentleman named T J Anderson. It’s architectural designs inside and out make it a very intriguing and interesting place. Not only that, the Temple provides a wonderful view of the surrounding landscape with its second-floor, open air balcony. At night you can enjoy the view across Wenslyeydale to the floodlit Bolton Castle. Depending on the season, the price varies from around $650-$800 per week. Hungary. Not “I’m hungry” (that’s what I thought when I was little…who didn’t? ), but the country of Hungary, or as the Hungarians call it Magyarország. I personally don’t often hear of this country as being a common tourist destination. But let me tell you, it’s worth the money to check it out. It is absolutely gorgeous. The picturesque landscape is full of lakes, mountains, rolling hills, golden fields, and dark forests. Dotting the hillsides, you will see ornate churches and quaint houses. The Danube’s bank nestle against the country’s capital, Budapest. In this large city, you will find McDonald’s and the ancient aqueducts from the Roman Empire. The signature food of Hungary is Gulyás (gou-yash). It’s a mix between soup and stew. It’s full of vegetables (potatoes/carrots/onions) and chunks of meat, not to mention the most popular spice in Hungary, paprika. It is usually served with slices of hot peppers. Note to self, do not touch face after cutting slices of pepper for the soup. It burns. Sometimes it is cooked outside in an open vat, which makes the meal even more tantalizing. Delicious? You bet. Saute bacon until crisp in large frying pan. Remove bacon and set aside. Stir sugar and salt into bacon drippings. Add cabbage, stirring until cabbage is coated with bacon drippings. Cover and cook 7 to 10 minutes. Add cooked noodles and bacon, stirring to blend. Adjust seasoning to taste. Spoon into a 2-quart baking casserole; cover tightly and bake at 325 degrees for 45 minutes. Spread sour cream over top of casserole; sprinkle with paprika and return to oven for 5 minutes more. Okay, I’m done with the food. It’s starting to make me hungry. 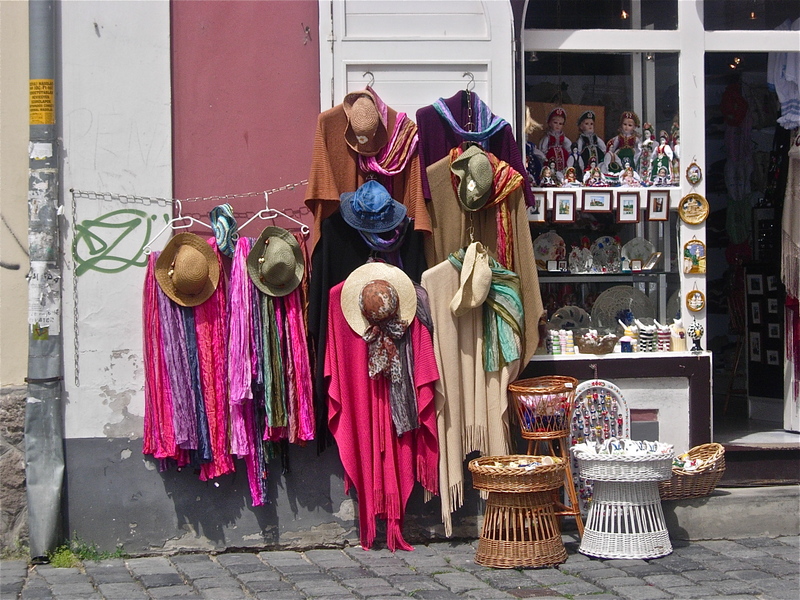 The city/town of Szentendre is full of quaint cobblestone streets lined with little shops. There is a certain spot in the town where you can overlook all the red tile roofs. Very old world and very memorable. Have you ever wanted to push a pause button on life and let time stand still? 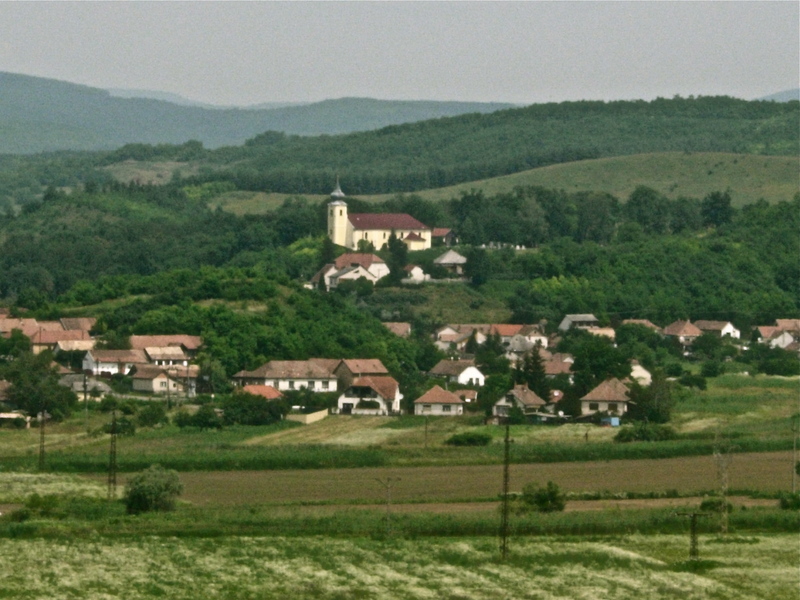 The little, rural village of Hollókő is just that. 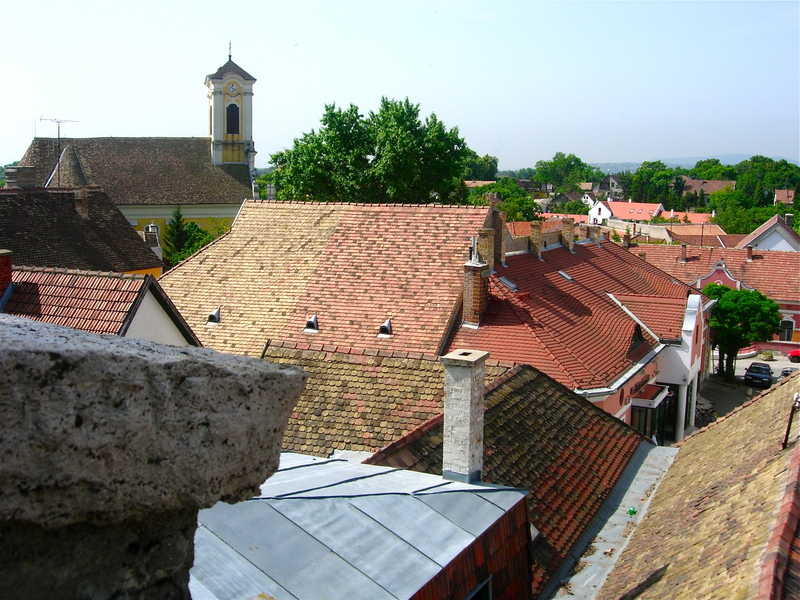 Developed in the 17th and 18th centuries, Hollókő has kept to itself over the period of time. Here all of the buildings are whitewashed, be it a home or a shop. And this is where I say, “Make sure there is a sign outside of the building before entering.” You may be barging into someone’s home. And that would be kind of embarrassing. Hollókő also has this amazing castle. It’s been dated back to sometime in the 1300’s. Climbing up inside of it and looking out over the hills to the edge of the dense forest will bring your imagination to life. Let it go wild…you’ll be able to see the enemy armies lurking behind the dark trees, or troops descending the mountains off in the distance. The village of Hollókő thanks to Krzyżówki from Wikimedia Commons and Ookaboo!